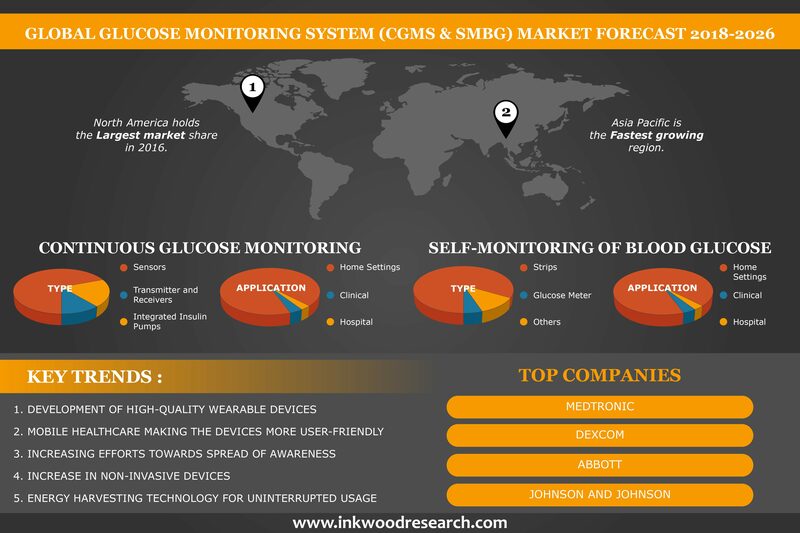 The Glucose monitoring system (CGMS & SMBG ) market is separated into Continuous Glucose monitoring system market (CGMS) and Self-monitoring of Blood Glucose (SMBG) market. The CGMS market is anticipated to grow from $ 1120 million in 2017 to $14519.3 million by 2026, at a CAGR of 32.94% between 2018 and 2026 whereas the SMBG market is anticipated to grow from $13192.2 million in 2017 to $24995.5 million by 2026. The important driver increasing growth in the global glucose monitoring system market is the rise in the incidence of diabetes and increase in healthcare expenditure, globally. Changes in lifestyles, eating habits, and reduced physical workout have led to rising obesity, which is the major cause of type 2 Diabetes in adults. The prevalence of type 1 Diabetics has also increased considerably. In 2017, the overall diabetes expenditure came to some 727 billion U.S. dollars; and it is expected to further increase up to nearly 776 billion U.S. dollars during the coming two decades. The applications of glucose monitoring system market are used extensively for various purposes. Professional CGMS are used by doctors to study the glucose level variations in patients. However, the market for clinical and hospital use of CGMS devices is limited, as these devices are still in the development and approval phase. On the other hand, SMBGs can be used by individuals personally. The frequency of SMBG depends on the type of medical therapy, risk for hypoglycemia, and need for short-term adjustment of therapy. Hospitals are an essential part of areas like treatment, disease diagnosis, disease surveillance programs, perceiving response to treatment, and clinical research. Use of diagnostic techniques helps in early diagnosis, thus enabling appropriate and prompt intervention which reduces the overall disease burden and promotes health. Hindrance from government regulations and lack of awareness of the diagnostic opportunities are the major factors restraining the glucose monitoring system market. Glucose monitoring system is a highly regulated market. It faces stringent regulations and approval issues from government authorities, especially the U.S FDA. Many diabetologists are also unwilling to use CGM in their practices as explaining the mechanism of this technology to the patients is rather time-consuming. Patients generally have frequent queries about the systems, including aspects like data download, troubleshooting, and interpretation. This report covers the present market conditions and the growth prospects of the global glucose monitoring system market for the forecast years 2018-2026, and considered the revenue generated through the sales of Glucose monitoring system for Components types as well as applications to calculate the market size by considering 2017 as the base year. The Glucose monitoring system market in North America is expected to hold the largest share by 2026. The U.S is the largest market for the current GMS, as it accounts for 75%-80% of total product revenues. Canada is one of the most developed nations. It has the eighth highest per capita income in the world. People from various races and ethnic groups reside in Canada, which is vastly populated by aboriginal people. On the other hand, the Asia-Pacific market is anticipated to be the fastest-growing region for the Glucose monitoring system market. The last three decades have witnessed an extensive increase in the number of diabetic patients, specifically type 2 diabetes and particularly in developing economies where more than 80% of the people with diabetes live. APAC is an emerging market with significant growth opportunities. APAC has a large unaddressed diabetic patient pool, as the region has densely populated countries. China and India have a large diabetic population, creating opportunities for GMS vendors to meet the market needs for diabetes management. Australia, Japan, and South Korea also have a large potential due to an increased focus on healthcare expenditure. The Glucose monitoring system market is segmented based on Component types. CGMS component types are sub-divided into sensors, transmitter & receivers and integrated insulin pumps; whereas the SMBG component types are sub-divided into strips, glucose meter, and lancets. CGMS sensor is used to continuously measure interstitial or blood glucose levels. CGMS sensors are small 9 mm devices, which are inserted into the subcutaneous layer of the abdomen, and are approved to be used for six to seven days. Most of the CGM devices secure transmitter to the skin and the sensor, so that its position is fixed and it doesn’t move around. Integrated insulin pumps are devices with an integrated CGMS. Blood glucose test strips (diabetes test strips) are a key component of blood glucose testing. A glucose meter is a medicinal device for estimating the concentration of glucose in the plasma. The other component type used in Self Glucose monitoring system includes lancets and other small devices. Lancets are designed only to be used once, and then disposed off in a safe way. Abbott Diagnostic, a manufacturer of in vitro diagnostics, offers a range of medical instruments, tests, and systems for clinics and hospitals. Abbott technology also develops manufactures and supply products for the in-vitro diagnostics market. Another company,Glysens is a San Diego based company, that develops Glucose monitoring system devices for the treatment of diabetes. The enrich product portfolio enables and helps to check the blood glucose level, gives automatic warnings when the glucose is at a low level or high level; and also shows historical charts of blood glucose values.